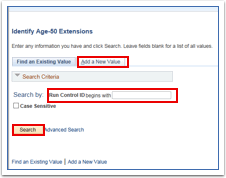 Purpose: Use this document as a reference for how to run the Age 50 Extensions for 403b and 457 savings plans in ctcLink. Run this process separately for each limit type, ie: 457 and 402(g). This process identifies and allows for those employees eligible for the 457 15 year catch-up, and the 403(b) age 50 extensions, to have the additional deduction limit of $6,000.00 added to their 457 and 403(b) plan. The 402(g) is the limit type for the 403(b) plan. This process should be ran prior to payroll processing. NOTE: Run this process separately for each limit type, ie: 402(g) and 457. Enter the Company or select from the search icon. Select the Limit extension that you want to run. Enter the amount specified by the IRS. Note: You can run this on individual employees if needed but typically you will run it for the entire company. 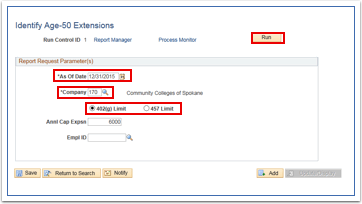 Go to the Process Monitor and select Refresh to see when the process has completed successfully.